Only Bond: He is the only 007 actor to have been married to a Bond girl. "Acting allows me to explore new worlds, to discover characters by delving into their lives, and ultimately to become someone else entirely." Pierce Brendan Brosnan was born into a somewhat broken family on the 16th of May, 1953. Father, Thomas Brosnan, promptly abandoned the family after Pierce's birth and as a result, he grew up living with grandparents while his mother, Mary, trained as a nurse. Brosnan was born and raised in Navan, Drogheda, a small town north of Dublin, Ireland before the unfortunate death of both grandparents and young Brosnan was moved from family-member to family-member and even into boarding houses. Brosnan recalls his childhood as neglected yet certainly memorable - reflecting later that his chosen profession was perhaps stronger because of it. As a boy, he spent a short spell in a strict and over-zealous Catholic school, whilst staying with a foster parent Eileen Reilly, as well as long hours at his Aunt's pub before, at the age of 11, being retrieved by his mother to live with her in England. Mary (who preferred to be called May) was at this point about to re-marry and Brosnan's soon-to-be step-father would take him on regular outings to the cinema. One film that particularly caught his eye was "Goldfinger". Pierce and step-father, William Carmichael, began to develop a strong relationship and Brosnan began to relish having a stable father figure in his life. During his childhood in England, Brosnan and family lived in Putney, where he was educated at Elliott School, a modern state school in the area. Here he was landed with the nickname "Irish" - for obvious reasons. Growing tired of the same jibes, Brosnan quickly learned to mimic the accents of the area and soften his Irish accent. During his schooling years, the young Brosnan thrived on English and Arts but elected to drop out of school at the young age of 16. Pierce was already enrolled in an Art School with the hopes of becoming a commercial artist and attending local drama classes at night. Brosnan was first accepted into an acting troupe when he applied to join the Kennington Oval House Theatre Club (on advise from a friend) where he volunteered as an Assistant Stage Manager in 1973. 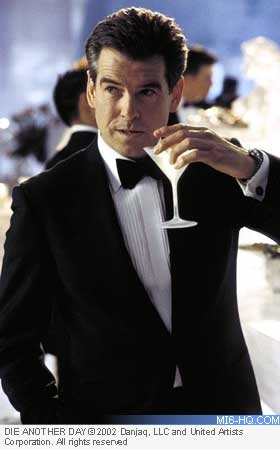 In order to persue a carreer in the theatre, Brosnan took any job going, from cleaning hotel rooms to waiting tables. Three years later, Brosnan would graduate from art school and join the York Theatre Royal, where he stage managed several successful productions before appearing on stage in his first performing role - "Wait Until Dark". During a run at the York based theatre, Brosnan was witnessed by highly-regarded playwright, Tennessee Williams who commissioned Pierce Brosnan to appear in his newest production - giving Brosnan an amazing boost in popularity. He performed the part of McCabe in "The Red Devil Battery Sign" which received an amazing response from audience and reviewers. By the end of the production, Williams issued a telegram to Brosnan, which read simply "Thank God for you, my dear boy" - a prized possession of Brosnan's today. After the success of "The Red Devil Batter Sign", Brosnan was invited to perform in London's Lyric Theatre where he'd play opposite Joan Plowright in a production of "Filumena". This production earned Brosnan further kudos and the Franco Zeffirelli directed production ran for 18 months solid. "I had good luck and a bit of talent somewhere in the back pocket that I could kind of polish and nurture, but I dreamt and wished for all of this, then you get all of that and you've just got to show up and work." In 1979, Brosnan began dabbling in television, including successful searies' such as "The Professionals" and "Murphy's Stroke". By 1980 he had made his first feature film, "The Long Good Friday". The same year, he went on to play in Guy Hamilton directed, Agatha Christie classic "The Mirror Cracked". Brosnan held small role but during the shooting was able to shake hands with the likes of Tony Curtis and Angela Lansbury as well as the director of "his" first Bond film! While his career bounds successfully on, Brosnan was unsuccessfully reunited with his biological father - who'd effectively cut all ties with his son in the first weeks of his life. Pierce felt even more distant from father, Thomas, than when he'd never known him. Happily, 1980 also saw the actor meet the lovely Cassandra Harris - although twelve years older than him, the pair were quickly married by December of the same year. Brosnan became a father figure for Charlotte and Christopher, children from Harris' previous marriage while the pair soon had a son of their own, Sean. When his wife was shooting Roger Moore's fifth outing as 007, "For Your Eyes Only", Brosnan took the golden opportunity to witness a Bond-filming and meet and greet. Cubby Broccoli and Michael Wilson were present, and immediately taken with the tall, striking Pierce Brosnan, vowing to work with him in the future. "Being an actor in Hollywood involves lots of things beyond acting. Charm really helps. And it's a good idea to incorporate a little Bond into all your dealings." Brosnan moved to American to extend his resume and work in a variety of television series before his star-status breakthrough. Spending a high-paced two weeks auditioning for various roles in Los Angeles, Brosnan came to be considered for a the ground-breaking role of mysterious PI, Remington Steele. Stephanie Zimbalist had already been confirmed the co-star and producers were looking for a tall, dark, handsome stranger to cast in their series - they found Pierce Brosnan to be the perfect blend of cheeky humor and a relatively unknown face in the US. 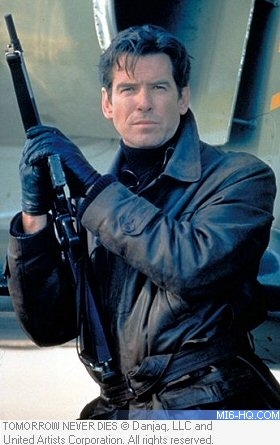 Brosnan shot his first scenes as Steele in 1982 and was a nation-wide hit. Some US newspapers went as far as to proclaim Brosnan the next Carry Grant and out of the success of Steele, Brosnan landed several Hollywood feature films. When, in 1986 Roger Moore announced he was standing down from the role of 007, Broccoli thought to turn to Brosnan to fill the secret agent's shoes. Despite some tough negociating with Brosnan's existing bosses, Broccoli could not get Pierce released from his "Remington Steele" contract any earlier. Ultimately, Timothy Dalton would claim the role and shoot two Bond adventures before legal action ceased the filmmakers' flow. 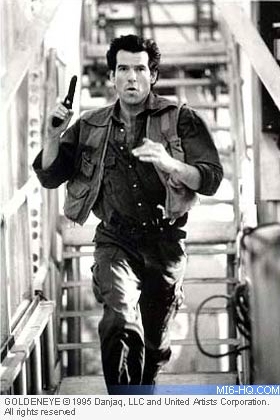 By late '87 Brosnan was released from his contract and was able to focus on the feature film industry - at first, shooting a picture with soon-to-be "Die Hard" director John McTiernan. Despite a sketchy period in features, Brosnan made his meet in mini-series including "Nobel House", where he performed the role of rich, prevalent and slightly twisted, Ian Dunross as well as starring in the classic adventure story, "Around the World in 80 Days" in which Pierce is the charismatic and eccentric Phileas Fogg. In a tragic turn of events, Brosnan's wife of 11 years passed away on the 28th of December 1991 from a long, troubled period of cancer. Cassandra Harris was just 43. Brosnan bounced back into features with the Robin Williams hit-comedy "Mrs. Doubtfire" - a surprising role in a surprising film for Pierce but one that would boost his career. 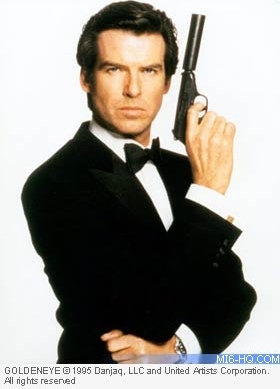 On the 8th of June 1994, on the set of the fated 17th James Bond film, Pierce Brosnan was introduced to the world as the new 007. His first film as Bond would be "GoldenEye", which ultimately cleared $350 million at the box office, and marked a big-time comeback for Bond producers. While he might have had a shot at clinching the role in '87, 1994 proved to be a far more appropriate year for Brosnan - he was older and far more worldly and jumped into 007's shoes with vigor and determination. 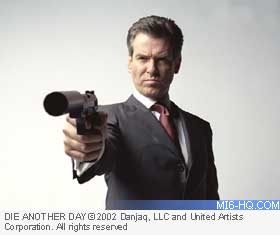 Brosnan make a streak of Hollywood blockbusters in the '90s including the comic "Mars Attacks! ", a dramatic adventure "Dante's Peak" and a slick and sophisticated remake of the "Thomas Crown Affair". 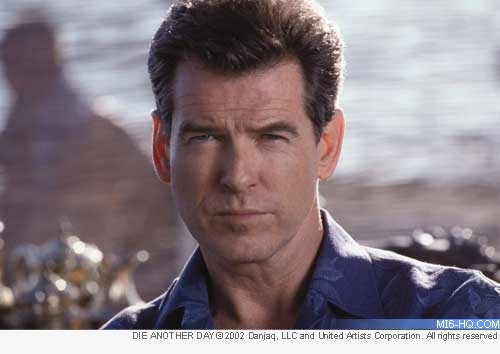 On top of these successes, Pierce Brosnan made three further Bond films ("Tomorrow Never Dies", "The World Is Not Enough" and "Die Another Day"), becoming an increasingly popular Bond for the new generation. In 1994 , Brosnan met Keely Shaye Smith, a journalist and retired actress he met during an interview. Their romance was kept relatively quiet until marriage in 2004. The pair have two children Dylan and Paris. "I've been very lucky in my life. Very lucky. I have been able to go through quite a few lives and still retain a certain identity and love of life. I have a new life, a new woman, a new baby. I also have a new realization, as a man and as an actor: This is where you belong." Brosnan was caught up in a change of direction when the franchise began to reconsider 007 for the new millennium. While heated talks that would dictate whether Brosanan was Bond continued behind the scenes, he would star in several adventurous, non-Bond outings, including "The Matador" and "After the Sunset". During this period he focused his own production company, "Irish Dreamtime", which produced several of his more alternative filmmaking ventures including "Evelyn" - in which Brosnan plays a father fighting for the rights to keep his children. "I think I was caught up between the egos of the producers and the studios, really. They (the producers) didn't know whether to go younger, they didn't know what to do, period." On the 2nd of February 2005, Pierce Brosnan confirmed fan fears that he would not return for the untitled 21st 007 adventure. In 2006, Brosnan played alongside Liam Neeson (a hot candidate in the press's eyes for 007 when Pierce won the role) in a bruatal Civil War drama, "Seraphim Falls" and most recently, Brosnan is set to sing and dace in Abba's hit musical "Mamma Mia!". Brosnan and wife Smith regularly donate time to a host of environmentally aware organisations, including the Natural Resources Defense Council (NRDC). In 2003 Brosnan was given an honorary OBE for his charitable work and in 2004, he was given duel Citizenship, between the US and Ireland.